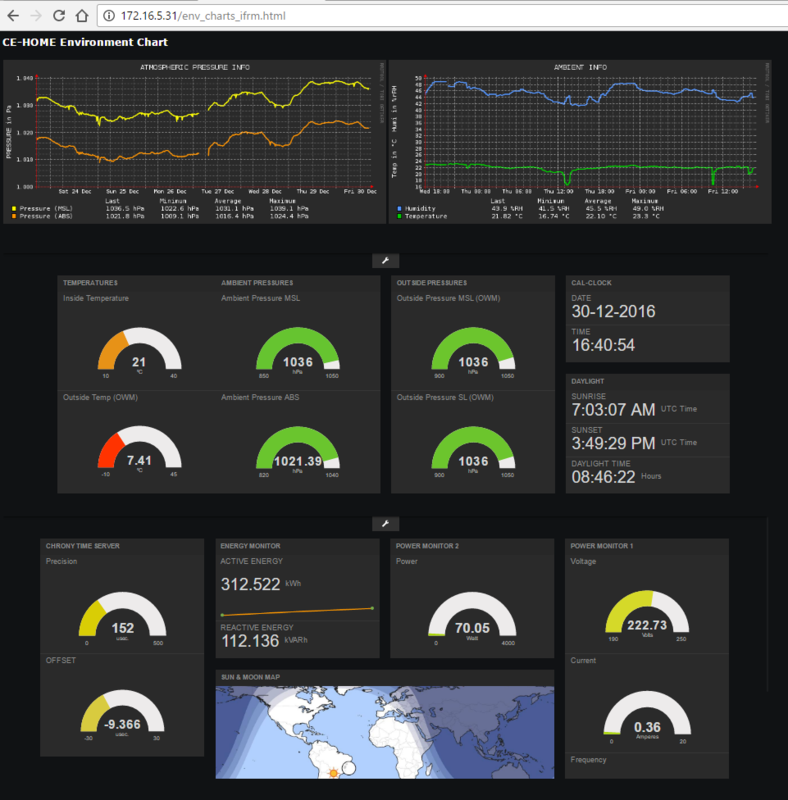 Among the several IoT dashboard solutions available, FREEBOARD is the best compromise in terms of ease of use, rapid set up and look. The proof of this are the several implementations and integrations visible on the web. However it has been built over time with several JQuery libraries, probably in the attempt to add quickly some nice functionalities. With this approach, the downside are the many little glitches and many little bugs, that plague the application. Poor documentation is also a drawback that will increase headaches in trying to dig in the code for extending it of simply try fixing it. As many other projects with a similar gestation, it is expected that sooner o later a major redesign or overhaul will happen fixing most of the known problems and creating new, of course, but this is they way it works. 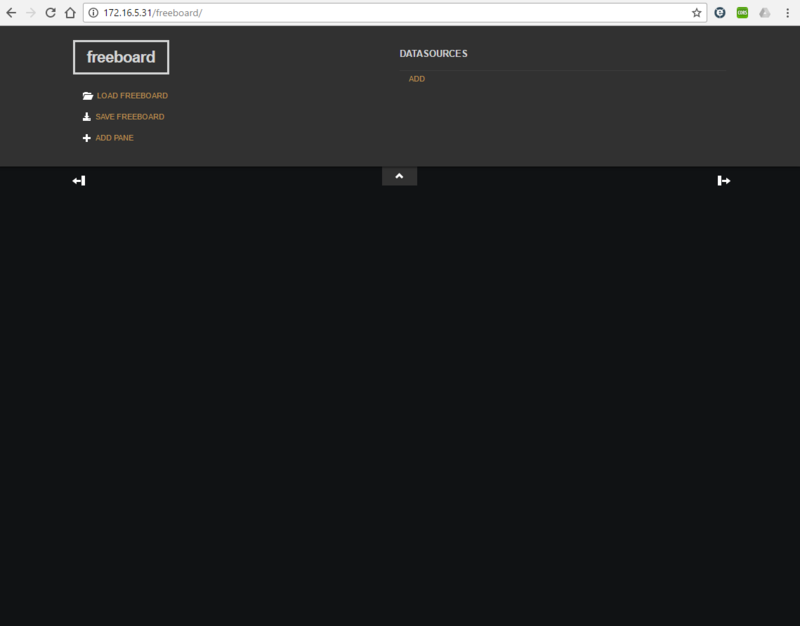 Despite this, FREEBOARD has many advantages for a casual user: It fast and easy to set up, adding widgets to the dash is really a snap and the usability is fair to good. If anybody need to put together few charts and gauges, FREEBOARD is unbeatable, but as soon as the dashboard’s complexity goes beyond than the basic level, then the glitches will become sensible and the advantages will quickly fade. In the dashboard pictured here below, the dashboard shows several gauges connected to Arduino and Raspberry PI sensors (Air Pressure, Temperatures, Humidity, Energy & Power, local GPS Time server, as well as some public REST API websites. With such a configuration, keeping the widget aligned, upon reloads of the configuration is impossible. Sometimes the workaround of reloading the configuration twice can help, but often not. Fiddling with the JSON configuration files wouldn’t help much either and the frustration level will raise, up to the point of dropping the project. If the scenario I described so far resemble your experience, well don’t give up, there are ways to make things works smoothly enough. In the following paragraphs and the subsequent pages, you will find some, hopefully useful, tips and tricks. Minimize budget for the hardware. No budget needed/allowed for paid services. Keep new code development to the minimum. Use and integrate functionalities of existing software and applications. Minimize the use of PHP, Perl, Python,, Ruby etc. Favoring the use of bash scripts and linux cli tools. Avoid where possible to rely on SQL databases. Keep integration, implementation, administration and control of the system as much easy as possible. Being able to administer the system from the least possible differnt interfaces/applications. Ambient sensors like BMP/BME X80 or HT11/22. uBlox GPS for time base. Eastron SDM 120 / 230 Modbus RS485 Energy & Power Meters. Raspberry PI3 Boards with Raspbian or Ubuntu OS . Quad Core J1900 Intel x86 Processor. Mini-ITX Motherboard, such as the ASRock Q1900-B-ITX. Client Devices for accessing information, such as PCs, Tablets or Smartphones. Ubuntu or Mint 64 bit (amd64) Linux distros for the server. Ubuntu Mate or Raspbian 32 bit (armhf) Linux distros for the RasPI boards. RRDTool (Round Robin Database) and its tools for collecting and graphing data. VirtualBox as the main VMs hypervisor for the server. LXC / LXD containers for container virtualization on the Raspberries. Apache2 or nginx Web servers or any lighter webserver capable to serve cgi-bin scripts and executables. Chrony for network time serving (much better than NTP). Documenting the installation of the operating system and middleware is beyond the scope of this page, but to define the baseline the server and the Raspberries shall have installed , at minimum, the linux operating system, webmin and webminstats, a web server with cgi-bin capabilities. Assuming (for the moment) the sensors are already installed and functioning. sensor data can be collected in webminstats RRD files cloning and configuring the “custom” webminstats module. At this point it is presumed that you have your hardware running, webmin is collecting data on the relevant hardware and you are ready to install freeboard. Someone may notice that the charts are not rendered by FREEBOARD, but by an RRDTool bash script that is launched as a cgi-bin application. Since the charting widgets available under FREEBOARD are based on JQUERY libraries such as JQPLOT and others and they are as clumsy as RRDGraph, and since the data is kept into RRD databases, it is anyway better to render them by using the RRDTool utilities. The RRD charts are rendered “on the fly”, without storing them on a server’s file. 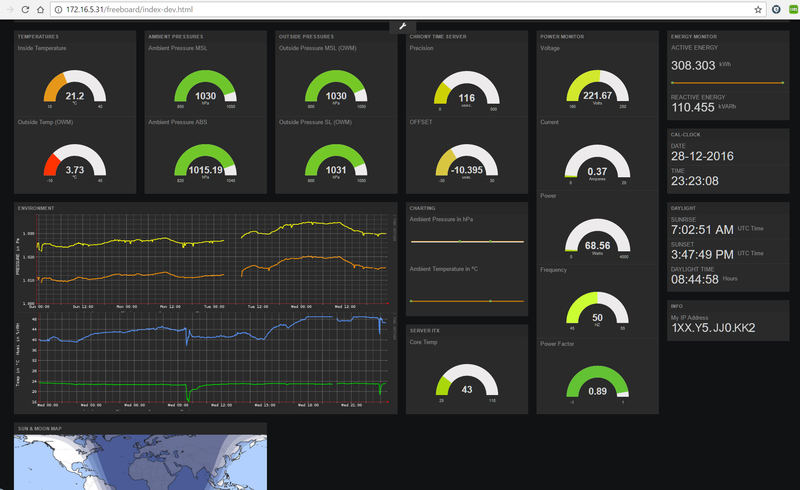 The bottom line is that the dashboard look even nicer and it is now more manageable, from the FREEBOARD point of view. default_value: "return ['#f45b5b', '#f9c802', '#a9d70b', '#55BF3B']"
More updates on this page coming in the very next future.